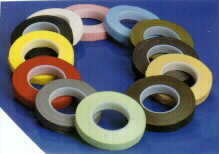 1" Wide Florist Tape - $2.80 each roll. Colors: Dark green, lt. green, white. $2.00 1" X 30 Yards - Comes in Red, Blue, Yellow, White, Green. Please specify color when ordering.